The Warrior Blowgun is a totally decked out hunting model with 4 kinds of darts, a sewn sling, and loaded with dart holder quivers. Looks awesome! Shoots great! This is one of our hottest selling blowguns. One look at this blowgun, and you'll be amazed at the arsenal of darts right there at your fingertips. You get all the same awesome darts and accessories that are offered with the Ninja model, and, in addition, you get the hunting series of darts, the spear and the broadhead. These darts offer more penetration and power for small game. You also get the additional quivers and dart guards for the safety Avenger is known for. The aluminum barrel of the blowgun is precision made to fit perfectly with the darts and other accessories and the parts are made in the USA, so you will never be disappointed over the quality of workmanship. 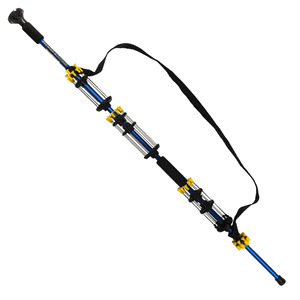 The Avenger Warrior is the most awesome, eye-catching blowgun offered!